← MICHAEL WEST Big Four: government’s binge on consultants goes ballistic. CHRISTOPHER SHEIL, FRANK STILWELL. Inequality stocktake … or snowjob by the Productivity Commission? The Productivity Commission has issued a new report called Rising Inequality? A Stocktake of the Evidence. However, when looking at the distribution of wealth in Australia, it turns out not to be a ‘stocktake of the evidence’ at all. Rather, it creates some new evidence that is inconsistent with the established sources of inequality data. The section of the report that deals with wealth inequality is the fourth of the report’s six chapters. This is of particular importance because wealth inequality is the most consequential structural feature of the rise in economic inequality. Growing wealth inequalities would almost inevitably lead to growing income inequalities in the decades ahead. Understanding the nature and size of wealth inequalities is of special interest to the Evatt Foundation because of the social and political implications and has been a major theme in the Foundation’s research and publications. It is our considered opinion that the new evidence on wealth inequality that the PC presents is of less reliable quality than the established data in showing what has actually been happening. It purports to show that wealth inequality has recently been falling, not rising, in Australia. This paper presents reasons to doubt the veracity of this claim. 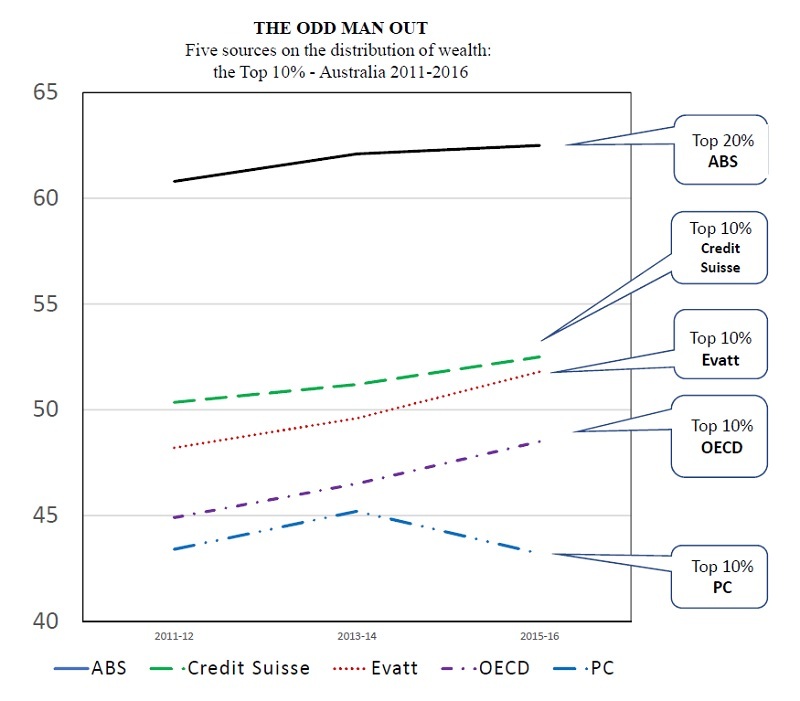 The PC’s central claim about declining wealth inequality rests on a decile-level series that draws on the ‘confidential unit record files’ (CURF) data that is available to approved users from the Australian Bureau of Statistics (ABS). This data is presented in its raw form in the figure below, where it is compared with the trends shown by four pre-existing series. The PC’s so-called ‘stocktake of the evidence’ took no stock of these other four well-established and widely published measures. The figure below is closer to a genuine stocktake of the evidence on rising wealth inequality, although it remains less than comprehensive. Mentioned neither in the PC’s report nor here are the wealth data published in the Australian National Accounts (a source that surprisingly eluded the PC). We have also left aside the HILDA longitudinal study, and data compiled from taxation records has not been included either. Nor have we used the rich-lists compiled by business magazines to show who’s who among the major wealth holders. It is also pertinent to note that the wealth data from all such sources typically ignores the massive wealth that now resides in tax havens. The total amount of this concealed wealth remains unknown, notwithstanding the evidence coming to light through the disclosures of the so-called Panama Papers and the Paradise Papers. The best estimates indicate that, world-wide, it is likely to be about the same as the total official value of Australia’s recorded household wealth. While not comprehensive, the statistics shown below might be characterised as a stocktake of the most basic and readily available evidence on the rising inequality in the distribution of the nation’s wealth. Helpfully for comparative purposes, each of the five sources, including the PC’s series, is based on the Survey of Income and Housing (SIH), which is conducted by the ABS every two years. The striking feature of the comparison is that all except the PC’s series show steadily increasing inequality over the period since 2011. The data produced by both Credit Suisse (on which Oxfam bases its research) and the Evatt Foundation suggest that the Top 10% now own more than half of the national household wealth. The OECD’s estimate of 49 per cent is just below that 50 per cent level. The PC’s series is a clear outlier in suggesting the asset share of the Top 10% is closer to 40 per cent. Its depiction of a decreasing inequality trend makes it even more clearly an outlier. How, then, can Credit Suisse find a Top 10% of wealth-holders having 52.5 per cent of the nation’s total wealth (up from 51.2 per cent), Evatt find the Top 10% having 51.8 per cent (up from 49.6 per cent), and the OECD find the Top 10% having 48.5 per cent (up from 46.5 per cent), while the PC finds only 43 per cent (down from 45 per cent)? It is important to get to the roots of such a discrepancy. For this purpose, we may provisionally assume that all the data are accurate in their own terms, but those terms must be subjected to critical scrutiny if we are to get to a true picture of the extent and direction of inequality, or at least the truest picture available from the sources. A forthcoming Evatt report on The Greater Wealth of the Nation: Current Data on the Distribution of Wealth in Australia will present a fuller analysis of the evidence on wealth inequality. In the meantime, some of the more obvious distinctions between the sources will be sufficient to show that the PC’s data is the least reliable of the five measures. For a start, the PC’s results are incompatible with the full ABS series, of which the CURF data is a subset. The ABS does not report on the Top 10%, only the Top 20% (in a quintile-level series), which is supplemented by inter-decile ratios. According to the ABS, the Top 20% share has increased over the period since 2011, and in the latest survey, it has risen from 62.1 to 62.5 per cent (of all Australian household wealth). The difficulty in this for the PC is that the corollary of its claim that the wealth share of the Top 10% has fallen from 45.2 to 43.2 per cent is that the next decile must have risen from 16.9 to 19.3 per cent: otherwise it would not square with the ABS’s Top 20% wealth share figure. In other words, the PC’s series not only implies a 2 per cent decrease in the wealth of the Top 10%; implicitly, this was in concert with a 2.4 per cent increase in the share owned by the next 10%. This lacks plausibility. There are no apparent advantages in accumulating wealth that apply to the second decile that do not apply with at least equal force to the Top 10%, which enjoys other advantages in scale, risk, time and intermediaries. In the absence of an exogenous explanation (such as an increased tax on the Top 10% that does not affect the 10% of households below it), the PC’s result is so improbable that it can be regarded as virtually impossible. The veracity of the PC’s result looks yet more questionable in the light of the ABS’s inter-decile ratios. These show that the P90/P10 ratio has jumped from 52.25 to 59.17. The P90/P10 refers to the wealth of the households at the 10th percentile (measured from the bottom of the range) divided into the wealth of the 90th percentile (i.e. the 10th percentile measured from the top). The (almost) 60 times ratio found in 2015-16 represents a rise of 13.2 per cent since 2013-14, the biggest jump since the ABS began surveying wealth (in 2003-04, when the P90/P10 ratio was 45). Contrary to the PC’s figure showing a declining wealth share for the Top 10%, the P90/P10 ratio implies that the gains of the Top 10% have been appreciably greater than those accruing to the Top 20% as a whole. The trends shown by the OECD, Credit Suisse and the Evatt Foundation reveal a more consistent pattern. The OECD series is drawn directly from the SIH and supplied to the OECD by the ABS, only differing from the official ABS series by the exclusion of superannuation (to allow international comparisons). Note that this exclusion tends to reduce the level of inequality, given the disproportionately large superannuation owned by the Top 10%. The Evatt series goes a step further by also excluding household durables, categorising them as consumption goods, consistent with the national accounts, the World Inequality Report, and the SIH’s non-market valuation of durables. The remaining series by Credit Suisse, the Swiss-based financial institution with global coverage, is the boldest attempt to reconcile the findings of the SIH with other evidence, taking into account the national accounts, rich lists and income correlations. It also exhibits best international practice by using individual adults rather than households as the unit of observation. The effect of splitting wealth equally across married couples lowers the level of inequality but neutralises demographic trends (due to the decline of marriage and the rise of single-headed households), implies gender equality, and recognises that children typically only access wealth through their parents. Superannuation wealth is included, but not entitlements to pensions, which dilutes the robustness of Credit-Suisse’s international comparisons. Considered in relation to this most realistic of the measures, the PC’s results look beyond belief. Other criticisms could be made of the PC’s report. For example, it utilises OECD and Credit Suisse data to make international comparisons of household wealth and show Gini coefficients without acknowledging their different compositions or recognising their contrary distributions. It utilises HILDA data without acknowledging that the longitudinal survey does not include any of Australia’s richest households (and which shows rising inequality in any event). There are several other minor faults, but the most disappointing feature of a supposed ‘stocktake of the evidence’ is that it does not publish the actual data it employs, preferring instead to present the results in simplified graphic forms, an opacity that severely limits cross comparisons and scrutiny. It remains that the most obvious logical explanation for the PC’s contrary CURF-based series is that it reflects the higher margin for error (both sampling and non-sampling error) in utilising a smaller sample than the Top 20% (1,005 observations compared with an ABS Top 20% of 3554). A similar but smaller anomaly in the CURF data, contradicting the direction of the full sample, occurred in the 2007-08 series. This is not to suggest that the accuracy of the ABS’s official data is beyond question. Australia, for example, is among a minority of OECD countries that does not over-sample the top end of the wealth distribution to counter the well-known problems of understatement associated with surveying rich households. There are also substantial discrepancies between the SIH data and the wealth data found in the national accounts that undoubtedly tend to compress the top end of the scale. In our view, it is past time for the national statistician to join best international practice by reporting domestically on the Top 10%, Top 5% and Top 1%, as it already does for the OECD, with full distributional accounts. Yet the important point is that there are no weaknesses in the current ABS series not shared by the PC’s CURF data, which has the additional weakness identified here. If the PC’s report were purely an exploratory statistical exercise, these problems would make it merely an irritating diversion from the task of trying to understand what is actually happening to wealth inequality in Australia. Drawing a long bow, we might interpret the PC’s numbers as a target, signalling an officially sanctioned acceptable level of inequality. Interestingly, in his landmark book Capital in the Twenty-First Century, Thomas Piketty posited that, in an ideal society, the Top 10% might own 30 per cent of the wealth, just three times its population share. If the share of wealth owned by Australia’s Top 10% were actually falling from its current 50-55 per cent to the PC’s 40 per cent, we might therefore think that a decent start along the road to the ‘land of the fair go’. But this is not the case. The PC is not talking about targets; it claims to be identifying trends. A more thorough stocktake of the evidence indicates that Australia is moving further away from Piketty’s ideal, not towards it. It is hard to avoid the conclusion that the PC‘s report, whether by design or oversight, only serves to deny the scale and severity of the growing inequality problem in Australia. Christopher Sheil is a Senior Research Fellow in history at UNSW and Frank Stilwell is Emeritus Professor in political economy at the University of Sydney. They are co-authors of The Wealth of the Nation: Current Data on the Distribution of Wealth in Australia, Sydney: Evatt Foundation (2016), and gratefully acknowledge CURF research assistance on behalf of the Evatt Foundation from Hao Zhai, PhD candidate, UNSW, without of course implicating him in the final product. This article was published by Evatt Foundation in October, 2018. One Response to CHRISTOPHER SHEIL, FRANK STILWELL. Inequality stocktake … or snowjob by the Productivity Commission? You would think that the Productivity Commission would provide a response to such a critical article. Or maybe it is still coming.